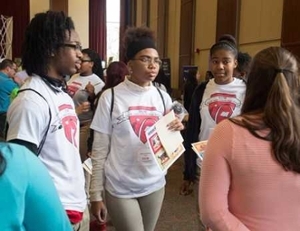 “Your Future Starts Today is a pilot pre-collegiate program designed to give Charter High School students of all grades overall information about college,” said Makesha Harris, SIUE academic advisor and coordinator of the program with SIUE academic advisor Efronsini Hortis. “We want to introduce Charter High School students to the college environment and get them inspired to come to SIUE or to any college,” Harris continued. Jayla Holcombe, CHS sophomore, plans to major in education and wants to attend SIUE. Jourdan Wilson-Hopkins, a CHS senior who plans to major in pre-medicine, said she found her SIUE advisor helpful in steering her towards additional courses that she should be taking this year to prepare for college. “She also reminded us about the importance of staying focused and being determined to finish high school strong,” Wilson-Hopkins said. “It was beneficial for the students,” said Danette Ross, academic advisor for the College of Arts and Sciences. “We talked about not just choosing a school, but researching it to find out the prerequisites and being mindful of the ACT scores required to enter those colleges. Your Future Starts Today is the fourth event of the year, according to Harris. The Pre-Collegiate Program held three other college-related activities at CHS earlier this year. “Efronsini and I will continue to work closely with CHS,” added Harris. “This program is a great way to get Charter High School students involved with SIUE and vice versa. The mission of the SIUE East St. Louis Charter High School is to prepare students, who are career- and college- ready, upon graduation. To achieve this mission, the school and its staff will positively impact the educational and economic lives of East St. Louis, IL youth. The SIUE Charter High School is a school-of choice for families in the East St. Louis School District 189. 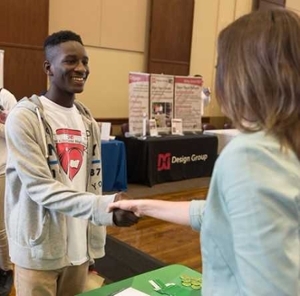 SIUE East St. Louis Charter High School (CHS) student Avantae Gully greets Courtney Mersman of Dieterich Bank at the October Career Fair. Gully participated in the daylong Pre-Collegiate Program at SIUE. L-R: CHS students Devin Addison, Kayla Dawson and Miranda May speak with Amy Heet of TD Ameritrade at the October Career Fair.